About Us – Monopole, Inc. Monopole Inc. takes great pride in being a “super compliant manufacturer” according to AQMD standards. Our state of the art research department consistently creates formulations for the best waterproofing, specialty and industrial coatings while easily satisfying environmental regulations. Monopole is proud of its 40 years of manufacturing and service success. Through complimentary “value added” programs like our “Red Carpet Inspections/Specifications” we have established a new standard of proactive and interactive service. 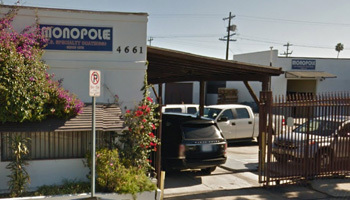 Our factory is located in Los Angeles which facilitates the needs of customers in the Western U.S. and beyond. For additional product/technical information or to order a catalog and samples, please contact us through our website or call (800) 491-9977. Remember, in rain, shine, or wet, Monopole is your best bet.